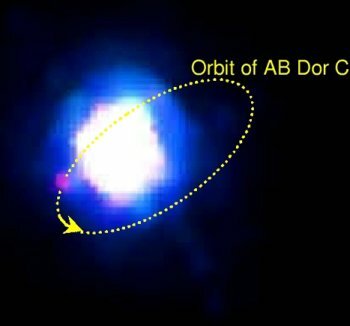 AB Doradus is a multiple system made of 3 stars at least. The largest of those, the orange star A, spins about 50 times faster than the Sun and therefore has a much stronger magnetic field. B and C are red dwarfs, whereas star B could be double. Star C is the star with the lowest known mass, only slightly above the border to a brown dwarf.